Granted, I haven't ridden very many here near Philly. But the bottom line is that California has a very unique set of roads. The combination smooth twisties, goaty twisties, desert, dirt, gravel, etc roads are unlike any other. Living in the Bay Area, you people have a ginormous cluster of roads that are awesome. Don't take it for granted! Get Out and RIDE. NOW! And I Know I've yet to travel south, which I'm DYING to do. Virginia, Tennessee, the Carolinas... it all looks heavenly! 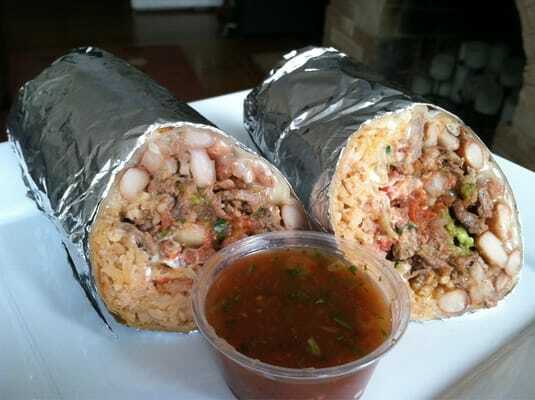 Yep, Burritos. I miss them. It's getting a lot easier but every now and then I crave a big, fat one. Gluttonous, delicious, carb filled goodness. I also miss the snobby, elevated breakfast food. Specifically, the Plow. 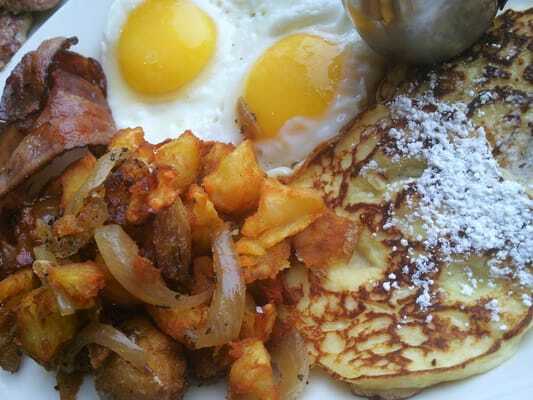 I know it looks just like regular bacon and eggs, but what you might miss is the fact that these potatoes are Fried! I know, such a small thing but so damn tasty. I've found some delicious breakfasts here, but everything is is just a little less refined so far. I'll admit, there are lots of tasty food options in Philly. Tons. But not quite the same, almost but not quite. This is probably more of a San Francisco thing, but I miss having every possible kind of store in a 10 minute radius from my house. 3 Movieplexes within a 10 minute radius, 3 costcos within a 15 minute radius, and countless specialty stores like Sports Basement. I know, when a city is made up of millionaires, you need every kind of possible retail establishment to feed the wealthy! I think one of the most difficult adjustments has been the motorcycle community itself. It feels strange not having motorcycle resources nearby such as MotoJava, MotoShop and more. There were so many, I devoted an entire page to these businesses that have been a part of the motorcycling community for a really long time. I know there are other resources available, but with a town that has such a large contingent of motorcyclists, it seems strange not having more dealerships and shops close by. There's this awesome service called PayByPhone. Practically every single meter in San Francisco is equipped with mobile phone payments! So convenient when you didn't feed enough time into your meter, and instead of walking 2-3 blocks over to where your car is to print out another paper ticket, you can do it all from their handy little app. Hopefully the mayor of this city is looking at this option to help push Philly further into the 21st century.